I'm trying two Rou Gui--one from Jip Eu, a local shop, and one from Teasenz--and a Tie Luo Han from that shop as well. I had written about the type here (one of Cindy's versions, and background research on te type), last September, which I had forgotten until checking. So many teas! I'd already tasted two of these teas there, in Jip Eu in the Bangkok Chinatown (they gave me the Tie Luo Han when I bought the Rou Gui; very nice of them). That shop is my favorite in this city for a few reasons, and selling good tea is only one of them (but kind of important, that part). I just visited another tea cafe owner from Chiang Mai there too, after that shopping visit, Kenneth of Monsoon teas, and we had a nice time tasting different things and talking about tea in Thailand. 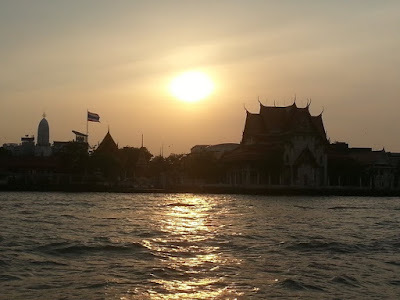 I mentioned that in talking about going to a Bangkok tea expo very recently, a post I didn't mention much in notice links to see how that would go. They sell local teas, flavored teas, and wild teas in that shop, probably worth checking out. Their Thai teas span a unique range, with plain versions likely of most interest to readers here, but one coconut flavored version really stood out to me, odd such a thing could be really good. Kenneth passed on a novel white tea; I'll say more about that later. 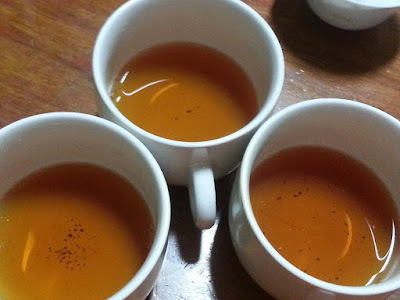 We tried a Thai black tea that the Jip Eu shop owner made himself, not commercially, just something he did. It was one of the better black teas I've tried from Thailand. That shop is 90 years old, ran by the same family over that time, but he's personally been helping other family members that produce tea in China, essentially making tea his whole life (just not full time). 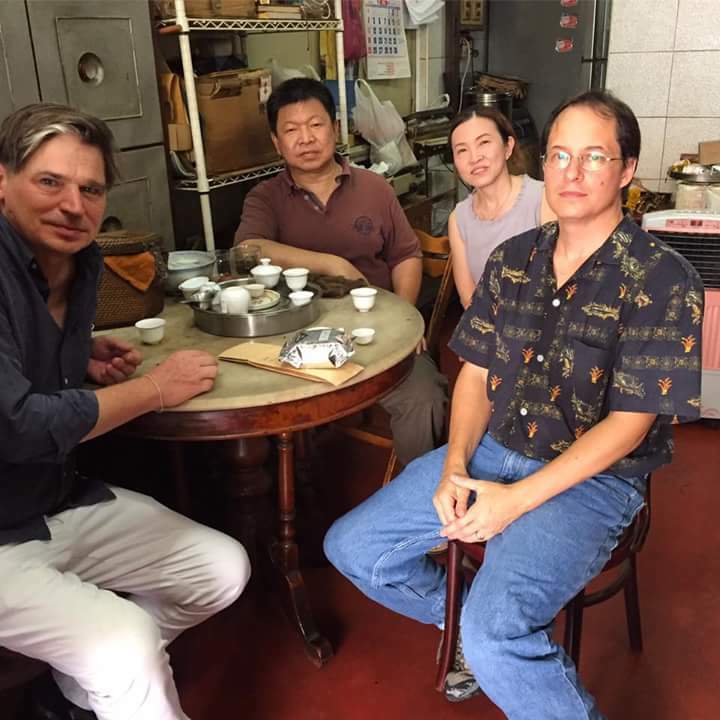 So he can turn out black tea, Wuyi oolongs, or Tie Kuan Yin (there are two branches of his family in Fujian). It'll make a great fall-back if that tea shop business doesn't pan out. And they're friendly about trying teas and discussing tea, just perfect. Onto these teas then. I look a bit serious. It was a hot day, a bit of a stretch drinking hot tea. My favorite tea I bought from them in the past was a Bei Dou, with just an amazing balance of character, with both aroma and taste filling in a nice full range. That should be familiar as the name of both a cultivar, one of the most original forms of earlier Da Hong Pao plants (along with Qi Dan), and as the location that comes from. Of course this Rou Gui is a completely different tea. Cindy Chen's versions sometimes have a really nice fruit aspect as part of that, always very well balanced with the earthy and mineral tones, but this is probably more typical, in the cinnamon range. It's not exactly like the cinnamon you add to oatmeal, but a bit similar. That Tie Luo Han was more subtle, more in the range of bamboo, which is nice, just completely different again, full bodied and flavored but still balanced and sophisticated. The third tea is a Teasenz Rou Gui sample, sent by them with that last order of a Shai Hong (compressed Dian Hong) and Longjing. It seems a little sweeter, with a bit lighter roast, and plenty of aromatic, perfume-like character. I'll dig into more taste by taste review and then move on to impressions, how well each works against my own preferences (a part that would vary by person). The Jip Eu Rou Gui is the most heavily roasted by a good bit. That bit of char taste wouldn't appeal to everyone, but then setting the tea aside for a year or two will cause a lot of that to drop out, or at lease ease up and transition some. Related to that, it's relevant if this is these are year's tea or last year's. I'm guessing last year's; processing for this year is more or less finishing up now, I think, but judging by taste along this Rou Gui might be new. Given how my memory works these days they probably mentioned it. Cindy doesn't sell some teas in the first year at all, and sometimes at this shop they'll offer both, and let you try how the teas varied over that year (it really is a nice place to hang out; you shouldn't plan on walking in and back out quickly). Why not just go lighter on the roast in the first place, you might wonder. Some people prefer heavily roasted teas, just as with French Roast coffee, and others would prefer the character a dark roast evolves to after a year or two. The roast level is supposed to go with different initial tea aspects to bring out the best results, per my understanding, and at the end of all that someone not into more roasted teas could just go with a different style instead. The cinnamon is an odd thing, strange to be writing about Rou Gui for so long and to feel like I'm coming back to this for the first time, in a sense. The shop owner said it wasn't the same type of cinnamon as in Western-version spice jar, although I'm not so clear on the differences. 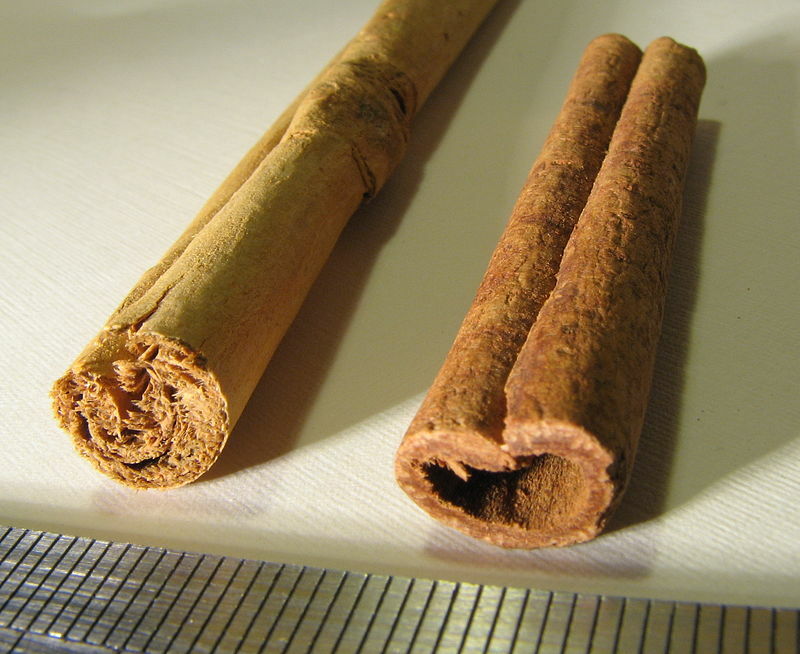 In reading up on cinnamon for another post there are two main types (two trees that bark is collected from as a spice), with one regarded as original or real cinnamon and the other a variant. .
Cinnamomum verum is sometimes considered to be "true cinnamon", but most cinnamon in international commerce is derived from related species, also referred to as "cassia". Glancing through that reference it's all complicated; there are lots of related types. So a spice merchant might be able to pin down more about the range, related to all that. 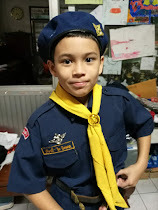 The other character is interesting (still on talking about the Jip Eu version). Beyond the roast / char input it has lots of earthiness and depth, a bit towards a brandy-like character, with just a hint of well-integrated fresh crude underlying that, and of course mineral. It works well, but judging how well depends on how one relates to the heavier roast. I can do heavier roast; for me it goes tea by tea if that aspect is working with the other aspect range or not, or if it's too much. The Teasenz Rou Gui overlaps in nature a little but is completely different. The roast level is lighter, the presentation of that cinnamon aspect a little different. It's sweeter, and the brandy-like aspect is more towards cognac, and that one trace of crude oil more like fresh tar in this (in a good sense). It has plenty of complexity and decent balance but it wouldn't be for everyone for different reasons. That sweetness is different, paired with such earthy character. It's unusual for tea to seem a bit too sweet but this is pushing towards that edge. The roast helps give it some balance, not as char effect in this, just one more layer of complexity (like charcoal still, I guess, but quite subtle in comparison). The "cinnamon" in both is different but comparable, and so close that I won't be able to describe that aspect-input difference. 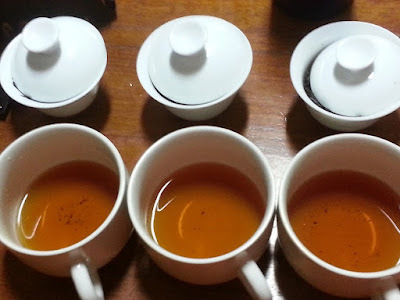 Neither Rou Gui demonstrates the balanced, structured, evenly complex aspect set better Da Hong Pao versions do, but then they're not supposed to be the same thing. And the flavor profile is quite different, just in the same general Wuyi Yancha range. The Tie Luo Han is on a completely different page. It's primary taste element is bamboo, not cinnamon. That's an interpretation, by the way; someone else could taste the same thing and think almond or wood, but once you think "bamboo" that's exactly it. The roast level is moderate so there's no char / charcoal to pick up, just more complexity from the flavors being shifted towards a dark toffee as that process results in. The sweetness in all these is somewhere in the caramel / dark toffee range, just a minor aspect compared to the other flavors, the taste part of that beyond being sweet. It would be hard to explain that "bamboo," or what else is going on. It tastes a lot like eating a fresh or cooked bamboo shoot, maybe a roasted version to soften and deepen the profile a little. If bamboo was completely unfamiliar, or just didn't come to mind, then one would describe this as woody, but in the range of an unusually light wood, like a sweeter and more complex balsa wood. The sweetness is nice, nowhere near on the level of the Teasenz Rou Gui, but enough to balance the rest. The general effect is clean; earthy and mineral elements combine well, integrating in a way that balances and makes sense. One the next infusion--nice and light, to help separate the flavors better, funny how that works--the Jip Eu Rou Gui cinnamon aspect seems even more pronounced, and the roast input eases up. This still isn't the cinnamon I put in my oatmeal, exactly, but an interesting spice input close enough to that. Prepared lightly the flavors are still pronounced, and well-balanced, but the liquor-like effect eases up a lot. The feel is still nice, not at all thin, and a pleasant spice-note effect lingers after you swallow it. The Teasenz version drifts into an earthier range, picking up woody tones, dark wood, although there is still plenty of cinnamon. It seems a little early for that standard transition; this isn't the move to a general woodiness lots of teas show when they're towards getting brewed out, I don't think, just a character transition. The feel is just a little thinner and aftertaste less pronounced than the other Rou Gui but it still comes across as nice tea. The Tie Luo Han shifts to be more complex. The bamboo eases up a little and more spice picks up, in between spice and earthiness, or across both. It's almost moving a little towards that Rou Gui character. Even brewed lightly the liquor-like aspect is still going on, one version of an "aromatic" versus taste-range characteristic. More transitions on the next infusion. The Jip Eu Rou Gui is fading a little, still in that same general range, but roast level / char input dropped way back. Other than being a little thinner it might be better, depending on preference for or against that. The cinnamon character is slightly less earthy, a little sweeter and lighter. Earthiness of the Teasenz version picks up, or really mineral character towards the range of earthiness, in between rock and rust (those types of aspects are typically nicer than they probably sound). It's not really improving but it's still nice. The Tie Luo Han moves into an interesting place, with the same aspects falling into a completely different balance. I was going to do more with subjective impression at the end, how I liked each, but judging only from how the character evolves the Tie Luo Han is clearly the best of these three teas. It's just as good as it's been all through the infusions, just different, and perhaps balanced even better. Next infusion--quite a few in--more of the same occurs. The Jip Eu Rou Gui stays pleasant and positive, just a lot lighter, and thinning, and the Teasenz version retains a late-developed earthiness that isn't so bad for my preference but not exactly an improvement. The Tie Luo Han stays balanced, complex, sweet, and positive, with that perfume / liquor like range overtaking the bamboo flavor, but it all integrates pretty well, it's a nice range. This last image might show the brewed color difference better, brewed a bit strong in one infusion to help flavors differences stand out (although in a different sense that works better lighter; brewing a tea stronger helps sort out the range of what's there for aspects, and flaws, and preparation on the lighter side works better for teasing apart sublte flavor components). 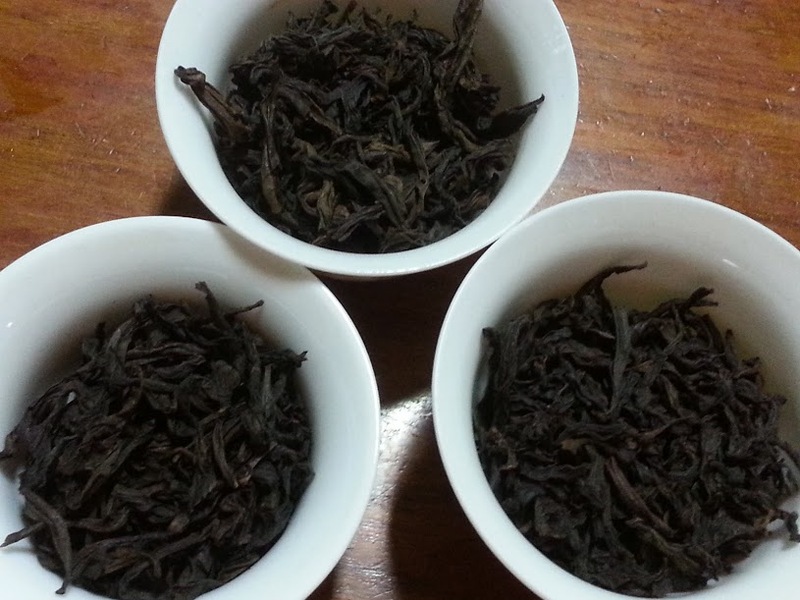 The Jip Eu Rou Gui on the right is darker, Tie Luo Han in the middle just a little more golden, and the Teasenz version (left) is a standard reddish brown. All three would be a slightly reddish gold brewed lightly. Related to methodology, this three-way comparison review process sort of worked, but seemed to truncate review scope mostly to flavors. There was just too much going on to map out all the aspects, to focus on feel and aftertaste just as much. You lose something in writing a description as you taste any tea as it is, it adds a bit of work and noise to the process, too much thinking, and multiple tastings with documented description is pushing it. Tasting across types, as I did here, can be a trade-off, since it's generally more informative to compare within a narrower range, but sometimes aspect or feel differences really stand out better with a bit of direct contrast as context. They were all three nice teas, good examples of the complexity and interesting character of different Wuyi Yancha. The Tie Luo Han probably is the best version in terms of quality level, and showed slightly more refined character, a little more complexity, and it stayed really positive over more infusions. I do like that flavor set in Rou Gui, the different type of cinnamon, drawing those two closer to even. I liked the Jip Eu slightly better but both are decent versions of the normal profile, if anything both a little heavier on cinnamon than I typically run across. Some others would surely be put off by the level of roast in the Jip Eu version but it matched the rest well enough to me. Cindy's Rou Gui tends to be fruitier (due to processing differences, growing area--I have no idea), but I like hers even better because they're just on a slightly different level. That's probably more a statement about my own preference than objective quality, but given that they won a local Wuyishan competition for one version recently--judged by the producers themselves--it seems inter-subjective agreement might apply in this case. I don't intend this judgement part to overshadow that trying a decent, type-correct version of a nice tea type is really the main thing. You can move on from there to try better and better versions, or appreciate aspects varying to better match your own preference, but it is by no means a given that if you order a tea sold as a good Wuyi Yancha version your experience will match that. Some taste like roasted cardboard. If you walk into a completely random shop and buy something that's moderately priced per my past experience you would be very unlikely to try a "good" tea (or "decent," but then I tend to not use those concepts consistently). I like "decent" teas too, especially when the character is interesting, but all three of these go that next step and taste sort of like the type should. I'm less familiar with Tie Luo Han so that style judgment is a bit of a guess related to that one, but if it is atypical at least that's in a way that works really well. Can you please tell me how can one part of this tasting thing? I so want to join you guys to have a chance to taste new products and review it.